Life post Civil War featured a lot of hardship alongside some promise. As America was picking up the pieces, a new frontier of promise opened up when gold was struck. In Rush, Callie Kimball's courageous story with a Yukon backdrop, a young girl heads west to escape a past of fear. Rush follows Belinda and her brother Frank as they journey to the Yukon in hopes of forging a new life. After answering an ad that is believed to turn Belinda into a prospector's bride, they soon learn that she is desired for her housework for a woman running a brothel. Rush may be a period play but it is rich in poignancy. Kimball fills her story with themes of morality and justice with a tinge of longing for hope all while offering a captivating mystery that slowly unravels. Structurally, Kimball plays with time, bouncing into flashbacks and speedy replays of moments we have previously seen. What the purpose of these moments in regards to Belinda's overall journey are never quite defined. Kimball introduces a detective into the story as a way to dive into exposition. It's a nice touch as it keeps the momentum consistent. Kimball has a poetic tone in her language that paints a vivid picture through her stories. While the primary focus lies on Belinda and Frank, Kimball introduces some intriguing secondary characters that happen to have a fascinating bond. Alice, the matron of the Yukon, and her innkeeper Rosie have, for the time, a special adulterated relationship. The taboo storyline briefly gets touched upon and it’s something that you want to learn more about. How does this relationship work at the turn of the century? But perhaps that’s an entirely separate play. Though their relationship served as a shock value twist, the truth behind Belinda’s story is gut-wrenching. You sympathize with her. But it takes until the truth is revealed to feel that. Finding a way to drop some gold nugget hints into Garrison the detective’s dialogue early on could easily make the end have more of an impact. The Rush company journeyed to 1899 and embodied the world of the play. As Belinda, Samantha Fairfield Walsh played her as damaged goods with Christopher Norwood’s Frank being the sturdy chaperone. Norwood’s Frank knew the sacrifices he needed to make to save his sister and it was touching to watch. Ryan George as bumbling boat buddy Jeb served as the comic relief that aided in lightening the darker tones of the script. Michael Markham lurked in the shadows as Garrison, offering an ominous presence. The breakout stars of Rush were Lauren Nordvig as Alice and Charley Flyte as Rosie. Nordvig had stability as Alice. Nordvig created a well-rounded character that was able to find humor and heart, but when she stood her ground against Garrison, Nordvig was at her best. Flyte gave Rosie a gruffness with an exterior that seemed hard to crack yet there was something deep inside. Just the way Flyte carried herself around the stage and how she stood and spoke brought great depth and insight to the character. Director Christopher Diercksen was able to make Rush feel perfectly lived in. There was suspense yet truth in his storytelling. While the wide expanse of the Yukon wasn’t always felt in the staging, Diercksen was able to create the multi-location world seamlessly using Jennifer Neads frontier-inspired set. 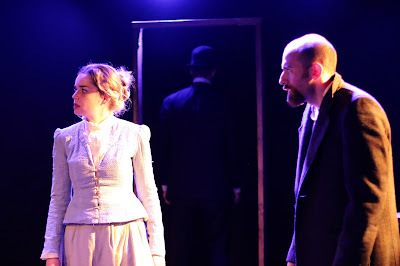 The gravel ground that Neads filled the Paradise Factory with was effective and added a strong nuance to the world of the play. The sound of footsteps on the tiny pebbles was sensational and brought the piece to the next level. It’s a risk that greatly paid off. Lighting designer Chelsie McPhilimy, sound designer Beth Lake and composer Ryan McCurdy were rightly in sync when it came to the quick shifts of breaths Belinda. They were evocative of life showcasing the power of a cohesive collaboration. Additionally, McPhilimy’s ability to create different atmospheres with light worked in the productions advantage. As the inaugural production for Team Awesome Robot, Rush proves that the company is well on its way to create intriguing art. Team Awesome Robot takes the audience to a place where they may not have ventured to before in a stimulating manner. Keep on eye out for this team.